A house would not be a home without its people. 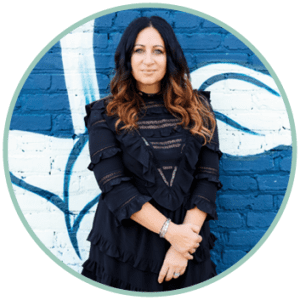 Making magic together longer than with their respective spouses [we promise it’s not weird], Wendy Lowden and Lisa Maloof have over 25 years of combined marketing knowhow. But there’s no “I” in House of Current. Only an “us.” And what makes us an “us” is the chemistry amongst our entire team. It’s the perfect mix of talent, wit, work ethic and wine preferences that makes our jobs fun and your jobs easy. Lisa’s Rule: Decide to be happy. How can you not be happy when your boss woman has that kind of decision-making process? 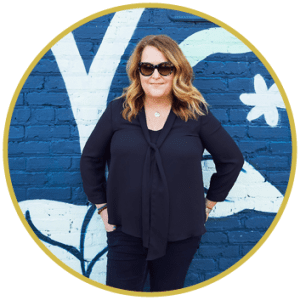 With more than 20 years of marketing experience, Lisa is a decorated Olympian in the world of retail, and keeps a notebook of secret solutions to client needs in her back pocket. When it comes to places to wine and dine, she’s an encyclopedia, and with a background in journalism, she’s probably distraught that half you kids don’t know what an encyclopedia is. Advertising was an early calling for her. And if something calls, you answer it. Then, once on the phone, she’ll impress you with her expansive vocabulary and probably make you FaceTime with her dog Trixie. Wendy’s Rule: Do it with passion or not at all. If we didn’t share an espresso machine with her, we’d swear the coffee Wendy drinks is more creative than whatever’s in our mugs. Great work takes heart, guts, and a heck of a backbone. Fortunately for Wendy, she has all of those things. Fortunately for everybody else, she uses them to create award-winning design time and time again. She’s the arbiter of style, she wrote the textbook on taste [yes, it exists] and if you disagree with her on color, we’d suggest you call your optometrist immediately, because “Pantone” is her middle name. Ok it’s actually “Sugarman” but either way, nothing leaves our doors, inboxes or closets without Wendy Sugarman Pantone Lowden’s sign of approval. She says she wears wedges because she’s short. We say it’s because her standards are high. Lamar’s Rule: Behave today as if this is the day you’ll be remembered. Lamar probably wishes this entire website was one big spreadsheet. And that difference in opinion is why we love her. Due dates, project numbers, client calls – things that typically turn creative folk into egg yolk – Lamar eats them on toast for breakfast. With enough southern charm to bless the heart right out of a saint, she’s got Wall Street negotiating skills and keeps projects running as smoothly as the Savannah, Georgia waters on which she was raised. And as a ‘Bama alum, she can shout Saban-style orders with the best of them. Which comes in handy when wrangling her four-legged football, Mosby. Scott’s Rule: Always try new things. Scott will never brag about himself, so we’ll do it for him. It’s not easy putting up with five women who turn to Play-Doh at the sight of even a squirrel that could possibly pass as a puppy. But Scott does so with patience and poise [and sometimes beer, frequently espresso]. When he speaks, you listen. He either has an excellent point to make or is about to reveal the meaning of life, which is said to lie in the patterns of his socks. 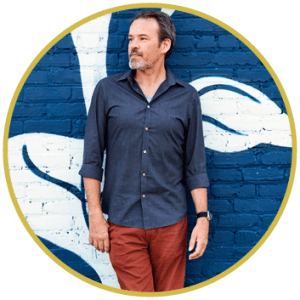 Both a dream crusher and a dream weaver, he’s the first person to tell us when an idea won’t work, and the first to offer up a solution that’s probably better that the original. From his vintage cars to his fountain pens, the man knows timeless style when he sees it. Or designs it. And his son Owen is cooler than you’ll ever be. We’ve accepted it. You should too. Rachel’s Rule: Never underestimate the power of a great typeface or a new lipstick. A master of design and a master of House of Current’s show stopping design, Rachel is the designer you’ve always wanted, and always knew you needed in your life. Her SCAD portfolio proves that she could vectorize circles around designers who only wish they could keep up. She holds more wisdom than a box of fortune cookies, and if you give her a seed, she’ll grow a forest. Hand her an ice cube and she’ll construct a 3-story ice sculpture with an elevator. Assign her a project and she’ll come back with things that make your ideas come to life long before you even knew you had the idea. We can’t confirm anything, but we’re pretty sure she can see into the future. No word yet on where she parks her DeLorean. Kellie’s Rule: Be kind. Wear great shoes. And don’t be afraid to get them dirty. Kellie has a way with words…or at least that’s what her professional expertise tells us. 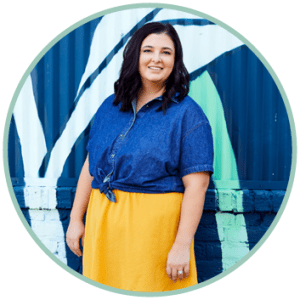 Whether it’s her ever-changing email salutations or her ability to throw out a headline, plus a few jokes, on the spot, Kellie aims to make others smile while always letting the big ideas shine. With a degree in Creative Writing, a degree in Copywriting, and a published-by-her-parents poem at age 6, (not) mincing words is in her blood. Hers are the hands that will sculpt your story and pet your dog. She gladly accepts compliments on her shoes and laughs at her jokes. Doing either of the two will quickly make her your friend and trusted creative partner. One warning: don’t mention Harry Styles in her vicinity. We won’t tell you what happens…but we did warn you after all. Madison’s Rule: The key to life is balance – if you eat salad for lunch, you can have cake for dinner. 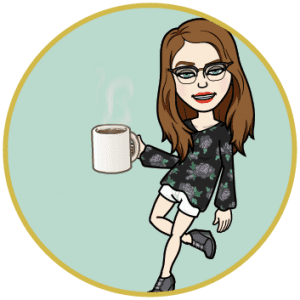 Madison was born a mermaid – she was originally going to be named Ariel, but her mom correctly decided Splash was the more iconic mermaid movie – and with that comes a love for anything holographic. This obsession has contributed to her lifelong creativity and has driven her to pursue a career in design. 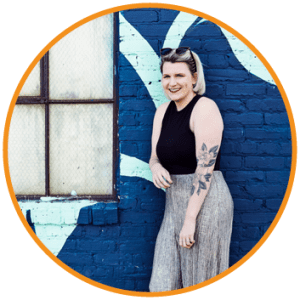 Madison comes to House of Current with multiple design degrees from West Georiga and The Portfolio Center, and a seriously cool repertoire of print experience and creations – fun fact, her greatest mechanical skill is operating a foil stamping and die cutting press! 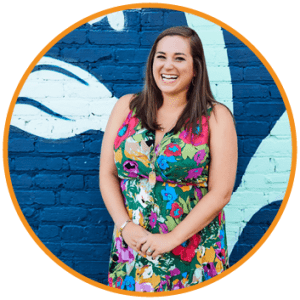 She’s our secret weapon and her eye for great design will lead your brand into beautiful places, and scratching her itch to travel the world will do the same for her – and will give her the great creative inspiration you’re gonna love!